Soak channa dhal for an 1 hr and wash it. Grind it to a coarse paste. Transfer it to a vessel and cook it in the pressure cook filled with 1 cup of water for 1 or 2 whistles. Cut the cluster bean. Cook it along with water- ½ cup, turmeric, salt and sugar. Drain the water after it is cooked. Split open green chili and red chili. In a pan pour oil, add mustard, cumin, curry leaves, green chili, hing and fry for a min. Add the channa dhal, turmeric, coriander powder, red chili powder and salt. Fry for 5 min in medium flame. Stir often, dont burn the bottom. After the dhal is fried for sometime, add the cooked cluster bean and coconut. Fry till they become dry. Garnish it with coriander leaves. 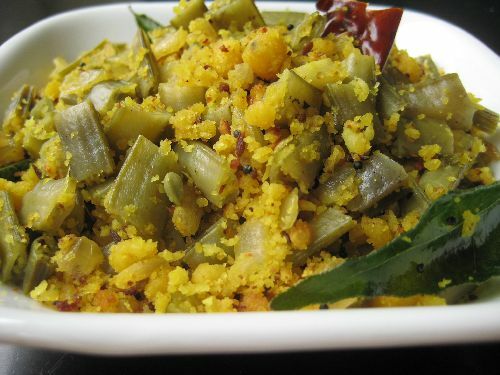 Serve as a side for white rice with puli kulambu or curd rice.